SALUTE TO TROOPS: Yesterday's "A Salute to Our Troops" featured entertainment, food, activities and military displays at Kapiolani Park. 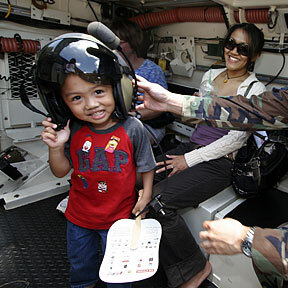 Raven Quiddaoan, 4, at left, tried on a helmet as mom, Jovelyn, looked on. The teen golfer ends with 3-under 214 after three rounds. Rescue crews will again try to find two boys who were lost in separate incidents. Snowbound Sapporo revels in the free use of color in an art exhibit by isle children. The Haleiwa resident is one of 23 players who will represent the U.S. at the World Cup. The Italian Riviera's medieval towns are best seen on foot. Local TV stations are working on getting their HD signals more widely available. In the meantime, viewers are left with few available programming choices. The U.S. Commission on Civil Rights has recommended that Congress reject Hawaiian sovereignty.